I would recommend this product. It's lightweight and works great in all carbon fork tubes. I have had one of these before, big problem solver! Love it! Had to renew my compressor plug, being 1" thought it would be difficult to source. Local bike store said a t least a week.... Needed sooner... Jensen to the rescue... Super quick delivery, great price, extra for expedited shipping was worth the otherwise long wait. BEST ANSWER: If your fork is designed for 1" (NOT 1-1/8") threadless steer tubes, this should fit fine. There is not a specific inner diameter as the collar is built in sections to expand outwards. This is not an answer Aaron. There must be "a diameter before expansion". My carbon fork has an inner diameter of 19mm, but the outer diameter is 28mm (1-1/8"). But NO expander for a 1-1/8" fork fits (these are too big). So if you can measure the diameter of the expander plug before expansion, will help me a lot. I'm having a very hard time finding a expander plug for my fork which has an inner diameter of 19mm. Thank you, Aaron. Is the top cap replaceable? Can I replace it with my own custom cap or is it fixed into the expander. 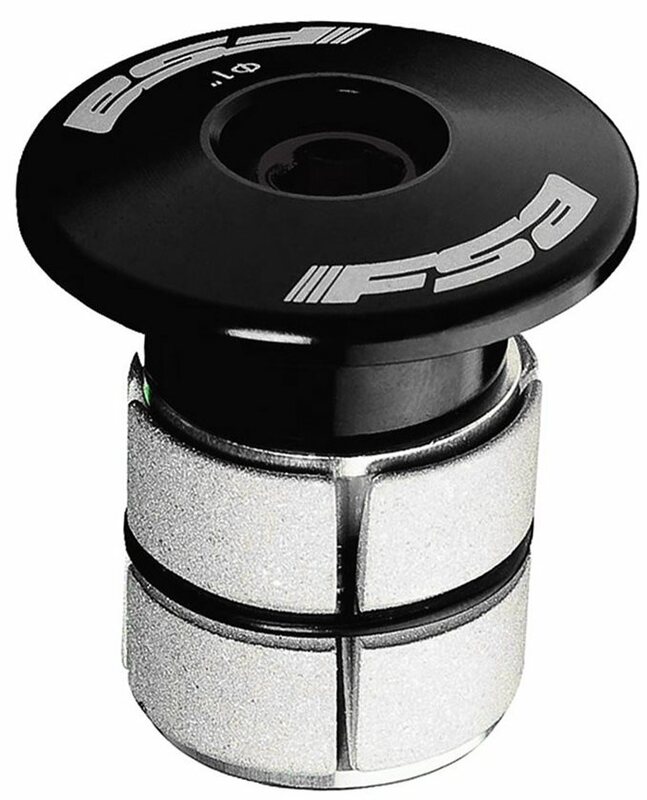 BEST ANSWER: It is replaceable but only with the same FSA cap. It is not a normal cap. It extends down about 1". The black part below the cap in the picture is actually still the cap. These CNC machined aluminum bar plugs close off the end of your handlebars for safety and add an attractive splash of color to your bike. Expanding rubber plugs fit all MTB bar diameters. 34 grams.